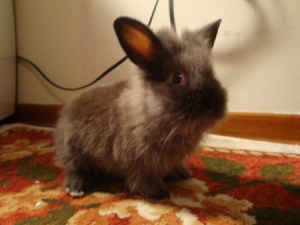 baby lionhead rabbit needs new home!! - adorable must see!! I saw your ad on Craigslist for the baby lionhead rabbit http://toronto.en.craigslist.ca/tor/for/1120895412.html . I am not sure how stupid you think the craigslist community is but I think it is pretty clear that that thing has the head of a bunny not the head of a lion. All you have done is combed his hair up so it looks like a mane. You are humiliating him, and yourself. I will give you $5 for this BUNNYhead rabbit. I think you just proved to me how stupid the Craiglist community is. You should look up Lionhead rabbits, as they are a new breed of rabbits that comes with a mane. There are two types of Lionheads, single and double mane. The one I have is single mane which does not appear to look like a full mane, but if that's what you want you can go find a double mane lionhead. Next time get your facts right before lashing out at other people with your ignorance. $20 for the rabbit? How much is that a pound? Does it come with any recipes?